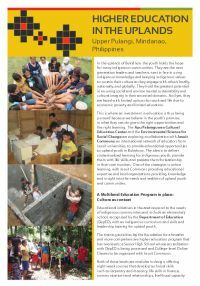 Tuén hu Uyag, or learning and living, is a program for indigenous youth in the Upper Pulangi, aged 15 to 29 who may or may not have finished basic schooling but are interested in learning with others a range of technical and social skills. In the uplands of Bukidnon, the youth holds the hope for many indigenous communities. They are the next generation leaders and teachers, next in line in using indigenous knowledge and keeping indigenous values to sustain their culture as they engage with others locally, nationally and globally.